These old fashioned banana split recipes make delicious frozen desserts that will bring rave reviews from your family and friends. Everyone remembers eating their first banana split and you're sure to remember eating these! They're so easy to make and with their all-natural ingredients, they're good for you too. Slice a banana in two. Place a spoonful of vanilla ice cream in the center, and top off with maraschino cherries, and pour cherry syrup over it. Price, 15 cents. Peel and split a banana and place the pieces on an oblong glass or china dish. On the sliced banana place a scoopful each of chocolate, vanilla, and strawberry ice cream. Over these sprinkle a few chopped nutmeats and a little rich fresh strawberry dressing made by mashing the berries in granulated sugar. Top each cone of ice cream with a dash of whipped cream and a large strawberry or cherry. A good seller at 20 cents. Peel and split a banana and lay the halves on a small oblong dish. On this put a scoopful of strawberry ice cream, and a similar quantity of coffee or vanilla ice cream. Over each cone of ice cream put a little whipped cream, sprinkle with macaroon crumbs and top with a cherry. Price, 20 cents. Use a long dish and put a small ladle of ice cream at each end. Then cut half of a banana into four thin slices lengthwise. Put two of the pieces on the dish in an outward V-shape between the two molds of ice cream, and then place a slice of sweet orange around the entire dish in each of the vacant places, or four all told. Pour over this an ounce of cherry wine syrup and a sprinkle of nuts; top off each mold with whipped cream and a red cherry. Price, 20 cents. Wash one dozen large, ripe bananas and then split the skins "carefully" lengthwise on one side only, and remove the fruit. Next, cut up six of the bananas in a mixing bowl, add one cupful of ground pecan nut meats, one-half cupful of shredded coconut, one pint of maple nut ice cream, and mix all well together; then take a spoon and refill the banana skins with the mixture, moulding it so that the cut edges of the skins will meet when filled; then place the bananas (sundaes) thus made in an ice cream cabinet to freeze and keep hard. Marshmallow topping, 1 pint; raspberry (or strawberry) syrup, 4 ounces; grape juice, 1 dash; shredded coconut, 2 ounces, and sufficient simple syrup to bring the dressing to the proper consistency (for pouring). Color the mixture the desired shade by means of red and blue coloring, both of which may be had in certified food colors. Red cherries may be used on top with, but the lavender marshmallow will carry out the color scheme to better advantage. "The name came to me by reason of the fact that one of our patrons, a very popular Southern girl, blossomed out in a very becoming attire of lavender. Her frequent appearance at the fountain in this garb helped to draw attention to the sign I had in mind. For this banana split recipe, place in an oblong glass dish one split banana, flat side up. Use three scoopfuls of chocolate, vanilla, and strawberry ice cream. On either side of the chocolate ice cream place a Nabisco wafer for the forward wings of the air ship, and in the strawberry ice cream stick an upright Nabisco wafer to represent the tail piece of the machine. On the chocolate ice cream place a red cherry to represent a man riding in the air ship. On either end of a fancy plate place lettuce leaves so that the half of each protrudes over the side. Take an ice cream cone, carefully break it apart to simulate a "shell." Lay the shell in the middle of the plate, and then with a No. 10-to-the-quart disher put in a mound of one-half strawberry and one-half vanilla ice cream, placing the cream partly on the shell and partly on one of the lettuce leaves. Cut a maraschino cherry in two and lay the hemispheres on cream so as to make two "eyes." To represent the "mouth" employ a whole cherry. Take half a banana, slice down the center, and use the two pieces thus formed to make the "claws," laying them in the corners of the shell on the side of the ice cream. Then take two Nabisco wafers and lay them crossed on a lettuce to constitute a side "lunch" for the salad. Sells for 20 cents. The following old fashioned banana split recipes are perfect when used with cantaloupe, honeydew melon, musk melon, and even the watermelon. Procure a number of rather large nice ripe cantaloupes. Cut one of them in two, lengthwise. Then cut one of the halves into strips of about two and a half or three inches in diameter across the middle. Cut a slice off the bottom of the pieces so that they will lie flat. Small, ripe cantaloupe (or musk melon), cut lengthwise. Scoop out seeds and fill cavity with ice cream (vanilla generally used); sprinkle with powdered sugar to taste. Price, 15 cents. On a six-inch plate place one scoopful of vanilla ice cream. Over this invert half a small ripe cantaloupe, which has been peeled, taking care to hide all of the ice cream. Now arrange four slices of banana at regular intervals around the cantaloupe, and top with whipped cream and a cherry. The author states that this is "a sure winner at 20 cents." Select small, sweet, and very ripe cantaloupes. Press all the ripe portion after rejecting the seeds through a sieve. To each two quarts of pulp and juice add one pint of orange juice, one pint of grape juice, and one-half pint of lemon juice. Sweeten this with three pounds of sugar. Let stand until a thick syrup has formed. Color with a little green and amber coloring. Freeze, and when the mixture has begun to stiffen fold in the stiffly beaten whites of two eggs and one pint of whipped sweetened cream. Pack in freezer and let stand four hours. Price 15 cents. In catering for the public taste for novelties in the sundae line, ice cream parlors gradually elaborated the original sundae idea of ice cream plus a flavor syrup into a more complicated and fancier dessert. The first of these fancy fountain desserts to win popularity — and retain its popularity — was the banana split. 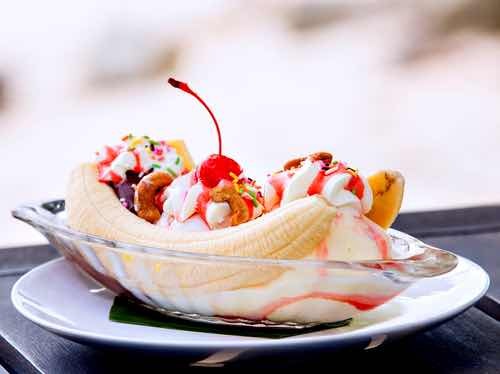 Back in 1904, David Strickler, a young soda fountain operator in Latrobe, Pennsylvania, is said to have invented the world's first "banana split" when he placed three scoops of vanilla ice cream on a split banana and garnished it with chocolate syrup, marshmallow, chopped nuts, whipped cream, and a red maraschino cherry. It cost only ten cents and was an instant hit with customers. Soon, the word got around and other soda fountain operators began making banana splits, and the novel sundae evolved into its classic formula: one scoop each of chocolate, strawberry, and vanilla ice cream on a split banana with a garnish of three different syrups, chopped nuts, whipped cream, and the essential red maraschino cherry with its stem. Over the years, splits became more elaborate. In the old fashioned banana split recipes above, you will find some very fancy and creative versions such as the Lobster Delight. The use of other fruits aside from bananas in splits, notably cantaloupes, was introduced in the late 1900s. Today, the banana split still reigns as the King of the Sundaes!